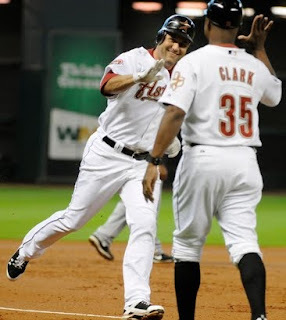 Lance Berkman continued to feast on Pirate pitching with two more home runs, and Roy Oswalt surrendered only a first-inning single to Neil Walker as Houston completed the three-game sweep of Pittsburgh by a 2-0 final on Thursday. Being that the game was played in the afternoon on a day dominated by Lebronageddon, this one got quietly swept under the rug by a distracted sports world, even in Pittsburgh. And "quiet" would once again describe the Pirates' bats in this series, with an output of just five runs in the three games. The Bucs currently rank 30th in MLB in batting average, hits, and RBI, and 29th in home runs, so this was basically just more of what we've seen all year. Other than those two Berkman dingers, Pirate starter Ross Ohlendorf struck out five and did not allow any other runs on the afternoon. Unfortunately, that was two runs too many, as Mr. Wonderful fell to a lowly 1-7 on the season, just a year after winning 11 games in 2009. In Ohlendorf's 10 starts in 2010, the Pirates have scored more than three runs only twice, which makes those Ws rather hard to come by. But this does not exactly qualify as breaking news. This series followed a familiar theme of "one step forward, two steps backward" for the Bucs, which took three of four against the NL Champion Phillies before a sweep at the hands of the offensively-challenged Astros. Berkman, who had eight HR coming into the series, put up four over the three games, and the 'Stros as a team hit eight home runs against the Bucs. Conversely, the Pirates' youth movement seemingly stalled in this trifecta of games. Pedro Alvarez was 1-for-10, Andrew McCutchen had just two hits, and Jose Tabata was 1-for-12. Only Neil Walker handled himself reasonably well, with a hit in each game. After this step back, the Pirates will try to lick their wounds and redeem themselves against the team that beat them 20-0 earlier this season. Milwaukee's Doug Davis (7.56, 1-4) takes on Paul Maholm (4.50, 5-7) on Friday night at Miller Park as the Bucs and Brewers meet at 8:10 p.m., the first in a three-game series. Sad when the LPGA is the most exciting thing happening in Pittsburgh sports. that and the schadenfreude over the fallout from the Cowardly "King"'s classless departure from the Mistake. I feel bad for Ohlie. Kid pitched a pretty good line and got NOTHING from the offense. THAT is offensive (pardon the pun).